The team beat Xavier, who was undefeated in the A-10, last Wednesday and two-win Fordham last Saturday. JOHN MEHLER TTN Sophomore guard Juan Fernandez shoots over a Xavier defender in last Wednesday’s win. Minutes after the men’s basketball team defeated Xavier, 77-72, Wednesday night at the Liacouras Center, Musketeers coach Chris Mack sat at the podium and opened with the following statement. This season, it’s tough to simply beat the Owls. Temple is off to a 17-3 start, its best start since 1993-1994. Thanks to a six-game winning streak and wins in 13 of their last 14 games, the Owls are ranked No. 15 in the country, and they’re in their sixth straight week in the Top 25 rankings. Xavier, who has been the face of the Atlantic Ten for the past decade, is taking a backseat to the Owls this season. With the win against the Musketeers, Temple leapfrogged Xavier to gain the top spot in the conference standings. “We’ve been preaching just another step along the way, and this is another step along the way,” senior guard and captain Ryan Brooks said after the Xavier game. Temple shot its best percentage of the season – 59.2 percent – as Brooks led the team with 22 points and seven rebounds. He was one of four Owls who scored in double figures. Before the game, Brooks was honored for becoming the 45th player in Temple history to reach the 1,000-point plateau. Brooks entered the Xavier game at 1,015 points after scoring a career-high 29 points in the Owls’ win versus Massachusetts Jan. 16. The same could be said when Temple traveled to Bronx, N.Y., Saturday afternoon to battle Fordham. The Owls, who shot 28 percent for only 22 points in the first half, exploded for 40 points in the second half for a 62-45 win against the Rams. The win improved Temple’s conference record to 5-0. And it was a myriad of Owls who produced on the stat sheet. Sophomore guard Juan Fernandez, who scored 15 points with a career-high seven assists against Xavier, paced Temple with 13 points and three assists. 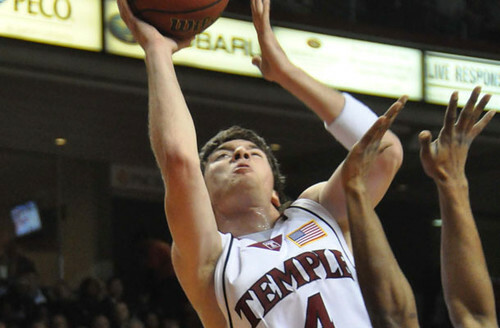 He hit two 3-pointers during Temple’s 16-4 run to open the second half. The Owls’ bench, which played a healthy amount in the second half, outscored the Fordham bench, 26-12. Sophomore forward Scootie Randall scored a career-high 12 points on 4-of-5 shooting from 3-point range. Freshman guards T.J. DiLeo and Ramone Moore added five and six points, respectively. As the winning streak, Top 25 ranking and conference lead continue, the Owls still have not received national praise for the résumé they have put together this season. Temple players – who are making the conference preseason predictions that picked them to finish fifth look wrong – couldn’t really care less. The crowd chants Juan Fernandez’s name during his first Temple game. The men’s basketball team defeated Virginia Tech, 61-50, at the Palestra thanks to strong defense and junior forward Lavoy Allen’s second double-double of the season. The Owls face Saint John’s tomorrow in the finale of the Philly Hoop Group Classic. Behind career-high games from Juan Fernandez and Ramone Moore, Owls rally to win home opener against Siena.